Skinned and split toovar or toovar dal is the most commonly used form of dal. It is used in popular recipes like South Indian sambhar, gujarati dals, the famous puran poli and lots of other tasty dishes. Toovar dal has a thick gelatinous or meaty consistency and takes a little longer to cook than moong or masoor dal. The glycemic index of Raw Toovar Dal is 29 which falls under low glycemic index range. Also the glycemic load of raw Toovar Dal is 4.9 which is classically low. 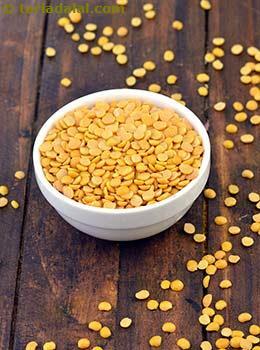 Is Toovar Dal safe for Diabetics? Toovar dal is an excellent source of complex carbohydrates which is the major form of energy. When you eat food it is broken down into glucose which is used by our body for energy. But the best part about complex carbs is it is released in the blood stream slowly and do not fluctuate your blood sugar rapidly. This makes it suitable for diabetics to have 30 grams of raw Toovar dal at a time to manage your sugar levels. Is Toovar Dal suitable for weight loss? With protein content similar to meat, poultry and dairy products, low in fat and high in fiber- legumes such as Toovar dal is considered to be the best choice nutritionally who wish to limit their meat consumption and lose weight. Controlling your portion size is important with combination of all food groups.